By making yourself aware of the truth about weight loss, you can avoid many of the pitfalls faced by dieters and find yourself on the path to a healthy lifestyle. Here are 6 weight loss myths that will help. Myth 1: The faster I lose weight, the better. Studies have shown that individuals who lose weight too quickly have a higher chance of backsliding and gaining back all of their original weight. Some will even end up at a higher weight than before. Realistically, a weekly weight loss goal of 1 to 2 pounds is the maximum that you should set. Myth 2: My friends lost X amount of weight in two weeks, so I should be able to, as well. Every person is different – some may lose a lot of weight at first and others might not. If you’re following a plan, eating healthy, and exercising, you’re improving your health, and weight loss will happen in the way that your body wants it to. Comparing your results to that of your friends may only serve to frustrate you. Myth 3: I should lose the same amount every week. It’s very rare to lose a consistent amount of weight each week. Many people will see faster weight loss in the beginning, followed by a slowdown, and maybe even a plateau. By charting your weight loss on a monthly basis, you can get a more accurate sense of your progress. 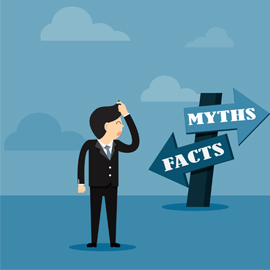 Myth 4: I will begin losing weight immediately. Don’t expect the benefits of your diet and exercise plan to show up on the scale the next morning. Your weight fluctuates regularly, depending on the foods you’ve eaten and the amount of water you’ve consumed. Even throughout a single day, your weight can vary by several pounds! Experts recommend weighing yourself no more than once a week in order to avoid the frustration that comes from daily weight fluctuations. Myth 5: If I fail, it’s all over. Setbacks are completely normal, and everyone experiences them at some point in their lives. Regardless of how committed you are and how hard you’re trying, you may still experience some problems. Rather than let them derail you, ride them out and move forward. Myth 6: The less I eat, the better. If you’re not eating enough calories and getting adequate nutrition, your body can go into starvation mode, where it will begin to hoard the food you eat by slowing down your metabolism. In order to lose weight, it’s true that you need to consume fewer calories than you burn, but it’s also essential that you eat enough to avoid a constant feeling of hunger.